Chief Minister Smt. Vasundhara Raje called upon the District Collectors to ensure that hard-earned public money being spent on different welfare schemes for the poor, deprived, women, youth and other needy sections be properly utilized. She said that they need to be highly vigilant because a huge amount of money from the public exchequer was on the stake. Smt. 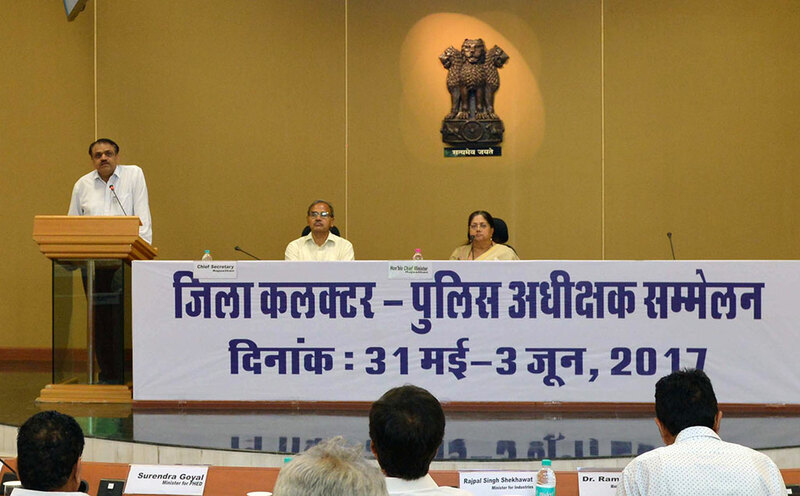 Raje was addressing the presentation sessions on the 2nd day of Collector-SP Conference at the Chief Minister’s Office on Thursday. During this, Additional Chief Secretary (ACS) of Social Justice & Empowerment Shri Ashok Jain, ACS Urban Housing Shri Mukesh Sharma, ACS Rural Development & Panchayati Raj Shri Sudarshan Sethi, Principal Secretary Agriculture Smt. Neelkamal Darbari, Principal Secretary LSG Dr. Manjit Singh, Principal Secretary Water Resources Shri Shikhar Agarwal, Secretary Women & Child Development Smt. Roli Singh made presentations about the ongoing projects and future plans of the respective departments. The CM asked the Local Self Governance department to order the RUIDP officials to visit sites of different development projects of drinking water, sewerage, drainage, smart cities etc and coordinate with the collectors in respective districts to make sure that projects were completed as per scheduled timeline. She ordered the district and department officers to focus on Swachh Bharat Abhiyan, Pradhan Mantri Aawas Yojana, Mukhyamantri Jan Aawas Yojana and complete the targets in time. She asked the officials to shift families residing in slums into the unoccupied residences made for them. During presentation on Goods and Services Tax (GST), the Chief Minister suggested that Rajasthan was having abundant raw material resources for several industries, thus more industrial units would be established here after implementation of the new tax system. She said that a better understanding of GST regime was must for garnering maximum profits out of this. For this, she asked the Finance Department officials to make general public and traders aware about the new system and organize training workshops for the district collectors and other officers of concerned departments. Secretary Finance Shri Praveen Gupta said that being a consumer state Rajasthan would gain maximum benefit out of this. He said that, with setting-in of this simplified tax regime and doing away with existing cascading taxes, inflation would be reduced. Not only it would curb black-money, even small traders concerns would be addressed by giving them exemptions in threshold limits, he added. The Chief Minister directed the Collectors and other officers for regular inspections of hostels of for the students of deprived sections of the society, ensure availability of proposed facilities and services at anganwadis and early verification of the lists of social security pension beneficiaries. She said that information charts and electronic display boards should be put up at the panchayat offices and public service centres displaying details of various ongoing projects including the sanctioned funds and expenditures. Smt. Raje praised the Disaster Management and Relief department and the Collectors of respective districts for their exemplary efforts for flood relief operations and dousing fire in forest areas. She asked all to be prepared for such efforts during the ensuing monsoon season and make coordinated efforts with others in emergency situation. She directed them for fast-forwarding the maintenance and repair works in canal-irrigated regions. The CM said that a new Mukhyamantri Beej Swavalamban Yojana would be launched to make the farmers self-sufficient for availability of seeds. She suggested the officers to offer this scheme to more and more farmers across the state. Enough stocks of seeds and fertilizers should be maintained for the upcoming Kharif crop season, she added. For better price of agriculture produce to the farmers, she asked the collectors to popularize e-National Agriculture Market portal. The CM further said that with a new helpline for public grievance redressal, more and more commoners would be benefitted. Members of the Council of Ministers, Parliamentary Secretaries, Chief Secretary Shri OP Meena and senior most officers of different departments are participated in this 4-day convention.